Parvini-Ahmadi, N., Khosravipour, M. (2004). Electroless Deposition of Ni-Cu-P Alloy on 304 Stainless Steel by Using Thiourea and Gelatin as Additives and Investigation of Some Properties of Deposits. 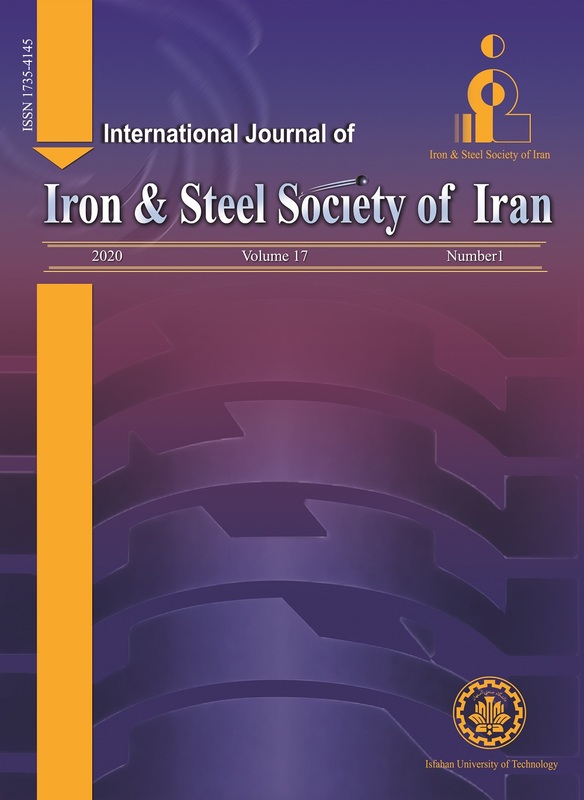 International Journal of Iron & Steel Society of Iran, 1(1), 29-34. N Parvini-Ahmadi; M. A. Khosravipour. "Electroless Deposition of Ni-Cu-P Alloy on 304 Stainless Steel by Using Thiourea and Gelatin as Additives and Investigation of Some Properties of Deposits". International Journal of Iron & Steel Society of Iran, 1, 1, 2004, 29-34. Parvini-Ahmadi, N., Khosravipour, M. (2004). 'Electroless Deposition of Ni-Cu-P Alloy on 304 Stainless Steel by Using Thiourea and Gelatin as Additives and Investigation of Some Properties of Deposits', International Journal of Iron & Steel Society of Iran, 1(1), pp. 29-34. Parvini-Ahmadi, N., Khosravipour, M. Electroless Deposition of Ni-Cu-P Alloy on 304 Stainless Steel by Using Thiourea and Gelatin as Additives and Investigation of Some Properties of Deposits. International Journal of Iron & Steel Society of Iran, 2004; 1(1): 29-34. In this research a layer of Ni-Cu-P was deposited on 304 stainless steels by using gelatin and thiourea as additives in a sulfate solution. In order to determine the properties of deposited layers, a microhardness tester was used for microhardness measurement, X.R.D. for microstructural analysis, and a scanning electron microscope equipped with E.D.X. for determining morphology and analyzing the deposits. The results of the experiment show that in the presence of additives in solution, deposited layers are rough, and elements such as Fe,O2 and S enter into the layer, in the presence of thiourea and in the presence of gelatin Fe enters into the layer. The microhardness of alloyed layer without using additives is higher than the microhardness of the layer obtained in the solution containing gelatin and less than that containing thiourea. After heat treatment, the microhardness of layers increases, the reason is the formation of stable Ni3P phase in structure. M. Ishikawa, H. Enomoto, N. Mikamoto, T.
Nakamora, M. Matsuoka, C. Iwakura, Sur. Coat. H. A. Sorkhabi, H. Dolati, N. Parvini Ahmadi, J.
Manzoori, App. Sur. Sci., 185(2002), ,155. R.D. Mikkola, Q.T. Jiang, B. Carpenter, Plat. J. Reid, S. Mayer, E. Broadbent, E. Klawuhu, K.
Ashtiani, Solid State Technoil. (2000) ,86. K. Lung lin, Y. L C. C. Chan Huang, F. I Li, J. C.
Hsu, App. Sur. Sci. 181(2001) ,166. J.E.A.M. V. D. Meerakker, J. Appl. Electrochem. K. Lung Lin, J. W. Hwang, Mater. Chem. Phy.